Mexico City artist Omar Inzunza—also known as Gran Om—never set out to be a poster artist. Having worked in a variety of mediums, Inzunza first tried his hand at graphic design when he volunteered to design an album cover for a friend. The experience quickly spiraled into a style rooted in Soviet and German propaganda, an attempt to reclaim the art for social movements, for the young and for the streets. So Inzunza has taken a break from the packed, stressful streets of D.F. to bring his work to Chicago for his first U.S. exhibition—and to talk to Gozamos about his work, Mexican art and the role of solidarity. 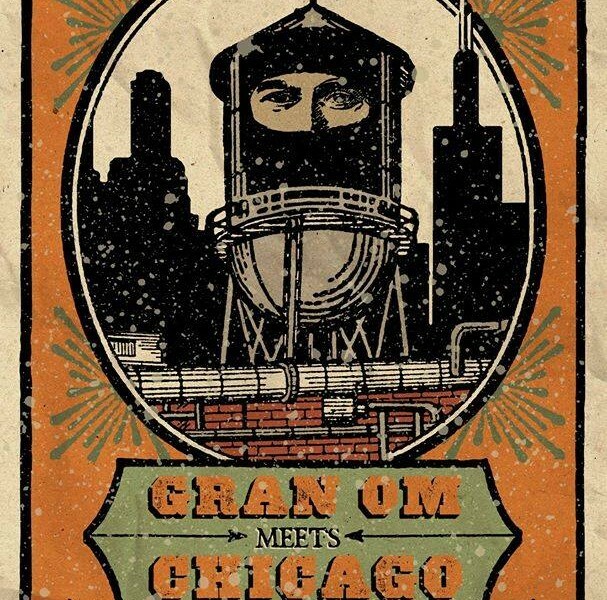 Be sure to catch Gran Om tonight, from 6-10PM at Cobalt Studio, where he’ll be exhibiting some of his propaganda-inspired poster art. Tell us a bit about your exhibition, as well as your plans for your time in Chicago. The exposition is going to be a review of posters that talk about certain situations in Mexico. They’re posters I’ve worked on and that have circulated [in Mexico] and that are going to be on display for the first time in Chicago. I’m excited to work with artists from Chicago. I’ve gotten a positive reception from local artists, and they have opened their doors to me and recognized what I’m doing. I still have a long way to go to improve and to learn. And I get to see all this amazing work from people in Chicago and see works that in other circumstances that I wouldn’t see. It shows me how far I can take my art. There’s also an opportunity for me to paint a mural on a wall along 18th Street, and I’d like to paint a mural of Palestine, taking advantage of how relevant the theme is right now. We may also have another mural in the works. What is the role of politics in your graphic work? My work has some political undertones for obvious reasons. But this exhibition isn’t explicitly political. There are posters that have political connotations, but more than political, they’re humanist. If you’re discussing these themes, inevitably you touch on political issues. You can’t be indifferent. But it’s not like I’m constantly looking to include political slogans. I think that social and humanitarian concerns are just inevitably also political. How did you first become interested in social and political themes? As a kid, my reference points in terms of social concerns were, without a doubt, rap music and all of African American culture. That was a really strong influence for me. While all my classmates were listening to other types of music, rock like Metallica and Guns N’ Roses and all that, I happened to have the opportunity to hear rap projects from the ’80s. It was a really combative era of rap and for the African American people. It was very politicized. So at age 10 I found authors like Martin Luther King, Malcolm X, Angela Davis and a whole movement that to me seemed super forceful and powerful. And all of that provoked an interest in social issues for me. Thanks to rap, I later encountered this combative and libertarian spirit around the Latin American movements, and tried to understand more about where I was: Mexico. But I attribute it 100 percent to that era of rap that was true to its political roots. What kind of reactions has your graphic work received in Mexico? It’s been a surprise for me because, as I told you, I had no intention of dedicating myself to graphic arts. If there’s one thing about my work, it’s that people turn to look at it, and they appropriate it. So it’s been curious that people have had such a positive reaction to it. I release a poster, and that same day—I don’t want to exaggerate, but in local terms, in Mexico, in D.F.—people have a reaction. They appropriate it for themselves, and they start to ask for more work. So, little by little, my graphic arts are starting to demand more of my attention and concentration and energy. How do the themes in your work apply beyond the Mexican context? In the end, the posters communicate something a lot more important than just specific instances. The posters I selected for the exhibition are a discourse that could be understood by anyone because they speak in general terms about different issues, a state of consciousness that is universal. I try to make messages that aren’t just things Mexicans will understand, messages that can be captured anywhere in the world. And I’ve had the opportunity to have people outside of the Spanish-speaking world—because the posters are in Spanish—know and feel how the works apply to their own realities. We all have certain issues that we care about, and we want to give them visibility in other parts of the world. So it’s not specifically important that people in the U.S. see what I’m doing. Because I try not to be nationalist, but more universal. I want people who see it in Africa to feel it resonates with them, but also in the U.S., and in Chile, and so on. I’m very influenced by the Zapatista movement. I lived for some years in Chiapas. And Zapatismo in a way formed me in moral terms, in terms of my ideals and values. It molded my character and my perspective on many things in life. And the Zapatistas have a phrase: that it’s one world in which many worlds fit. So that’s along the lines of what I’m trying to communicate with my graphic art. There should be no a difference between what’s happening in Palestine, in New Orleans, or in Chiapas. And it’s not that we always have to be aware of what’s happening in every place, but when you become sensitive to it, you have a certain degree of solidarity. And that encourages people on the other side of the world. What’s taken most of my time and energy this year has been my graphic work. So because of that, I’ve been distancing myself little by little from producing movies. But I’m still involved in these documentary projects in Mexico, and I have one that’s a project of video clips called “Videoclip y discurso.” What I’d like to do is drive certain musical projects in Mexico—not only in D.F., but around the country—that are politically and socially conscious and express that in their songs. And what I’m trying to do is promote them, little by little, as much as is possible. Because there are resources and money involved that these groups don’t have and that, most of the time, I have to put the resources in myself. The most important project of everything that I’ve done is one that will open in September called “Protesta.” For that project, I invited about 16 Mexican singers to make a song that vindicates protest, because right now there’s a context of repression in Mexico and a criminalization of protest. So that’s taken a lot of my time. What’s the art scene like in Mexico? In Mexico, it’s funny because there really isn’t an independent art scene. It has a lot to do with economics. There are a lot of people making art, trying to do things. But sooner or later, they stop doing it because their first priorities are the essentials. So little by little, they stop working on their creative projects to go into a traditional job, to take care of their families. I see that my close compañeros start distancing themselves from their projects to live day to day, find a job, pay rent. All those concerns in a country like Mexico—it makes it twice as hard. Because on the other hand, artists in Mexico can’t live from their work. It’s a reality that’s very depressing, but it’s so true. So they make these incredible works, but they don’t have the mobility because there aren’t people who buy art in Mexico for the same economic reasons. There’s not much of a culture of art consumption. And on top of that, if the themes of your work are political or social, it’s worse. Because the art institutions and state infrastructures that decide what’s culture and what’s not, what’s art and what isn’t art—well, it’s not direct censorship, but they won’t fund you, they won’t support you. And it’s the same thing with the people who are able to collect art. They’re indifferent to your work. So it’s very difficult. But people are trying, and I think it’s a good moment to find strategies to maintain a scene and be able to live off your work. I’ve been very fortunate because I can live from other things. My job that generates income is something else, so I can finance my personal projects. It’s twice the work, but I try. Visit the Gran Om and Cobalt Studio on Facebook.